Pilgrims both young and old walk across 100 kilometers of uninhabited jungle to attend the Kataragama Esala festival. Over 300 Tamil and Sinhala pilgrims arrived at Kataragama on foot in the annual Kataragama Pada Yatra on July 13 for the Kataragama Esala Festival. Some 70 pilgrims of all ages walked 36 days from Trincomalee and Mutur while others joined singly and in groups from points along the coastal pilgrimage route. Last year security officials registered the arrival of over 6,000 such pilgrims who had walked through the Yala National Park. According to Major Jagath Perera who is directing efforts to welcome such pilgrims coming through the park, peaceful conditions in the Eastern Province have prompted more pilgrims to walk to Kataragama this year than in past years. As many as 10,000 pilgrims are expected to walk to Kataragama before the Maha Perahera is conducted in the evening of July 28. Devotees from Great Britain, Canada and America wore the pilgrims' traditional dress and walked the distance from Trincomalee to Kataragama. The Kataragama Devotees Trust has played a key role in promoting Kataragama's age-old pilgrimage traditions since its founding in 1988. The famous temples of Koneswaram, Verugal, Sitthandi, Batticaloa, Mandur, Tirukkovil and Okanda are along the Pada Yatra route. 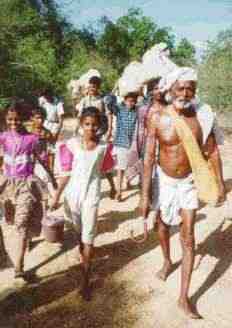 All along the route the pilgrims received dana or food offerings not only from Tamil, Sinhala and Muslim villagers but also occasionally from the security forces. Relatively peaceful conditions in the Eastern Province have prompted more pilgrims to walk to Kataragama this year than in past years. 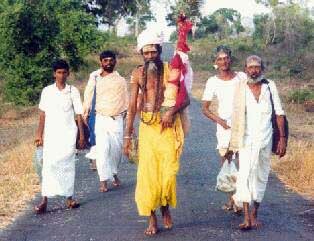 Photo of 1992 Pada Yatra taken by Patrick Harrigan. According to those who walked from Trincomalee, far fewer terrorists were in evidence this year compared to previous years. However, an isolated attack occurred at Eravur on June 17 just as the pilgrims were passing by the Eravur police station. Several combatants were killed or injured in the incident but miraculously no Kataragama pilgrims were injured. The pilgrims believe that they are protected by God Kataragama at all times.  Nevertheless, almost every year the Yala jungle claims the life of at least one pilgrim. Already this year security officials in the park discovered the body of a swami from Karaitivu who had been mauled by a bear. Security officials in the park have been helping to evacuate the sick and elderly pilgrims by vehicle to the Kataragama district hospital. According to KDT Pada Yatra field representative Patrick Harrigan, the Kataragama Pada Yatra traditions has for centuries been one of the great unifying factors in Sri Lankan society. The Pada Yatra swamis, he said, are looking forward to the day when they can once again walk from all corners of the island including the Jaffna and Mullaitivu districts.